Founded in 1967, The Overlake School is an independent, nonsectarian, coeducational, college prep day school. Each Overlake community member is committed to the school's mission to Inspire excellence, Develop intellectual curiosity, Teach responsibility, Embrace diversity and Foster a compassionate community. The Overlake School is accredited by the Northwest Association of Independent Schools, the Washington Federation of Independent Schools, and the The Northwest Accreditation Commission. Overlake is committed to diversity and does not discriminate on the basis of race, religion, national or ethnic origin, socio-economic status, gender, sexual orientation or disability in the administration of its educational policies, financial aid or other school-administered programs. Interscholastic Athletics Program: Emerald City League, WIAA. Soccer, cross country, volleyball, basketball, lacrosse, ultimate, tennis, golf and baseball. Inclusive policy: every student has a chance to play at both Middle and Upper School levels. Arts and music classes, including: dance, drama, stagecraft, woodshop, ceramics, drawing, painting, sculpture, photography, graphic design, jazz band, concert band, orchestra and choir. The Overlake campus has been called "a green island of forest, pasture and wetland," a rural oasis in the busy Eastside. 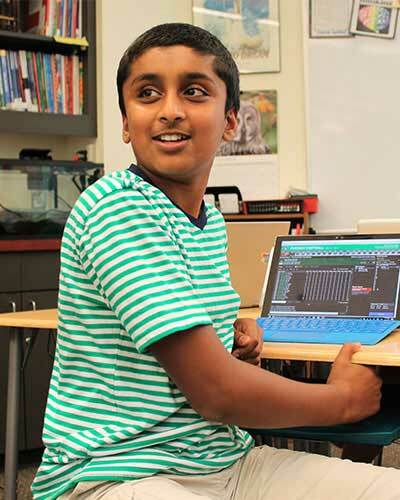 The Overlake School is located on 73 acres of natural growth in Redmond, Washington, home of Microsoft. Once a farm, the campus combines a rural, reflective setting with access to neighboring high tech-resources. Tall firs, white fences, converted farm buildings and state-of-the-art math, science, technology and arts facilities combine to create Overlake's unique environment. The campus is designed to complement the physical environment, blending in well with the green space. The campus setting encourages an equivalent personal growth in the students as they live and learn in this beautiful, peaceful environment. Developed as the Fund-a-Need project for the 2008 Overlake School Auction, OWLS was created as a way to take advantage of the campus's expansive undeveloped acreage. But rather than clearing and developing those spaces, OWLS uses the property's signature rural nature for new outdoor learning spaces. The installations include an outdoor classroom, a fitness course and a student art gallery; a weather station providing real-time readings online; and a 2.5-mile system of five trails, varying in length and difficulty, each including interpretive signs and trail marker posts. Advisory Program: A teacher and a small group of students meet each morning in homeroom. Distinguished Lecturer: An annual program featuring a speaker of note who visits campus and works with students and faculty. An evening program is open to parents, students, faculty and staff, alumni and the general public. Eighth Grade Field Studies: Capstone experience for Middle School students combines academics, outdoor education and transition to Upper School. Global Service Projects with partner schools in Uruguay and in Cambodia. Outdoor Program: Includes backpacking, rock climbing, backcountry skiing, camping, mountaineering and kayaking. Two days of outdoor trips required for graduation from Upper School. Project Week: Annual requirement. Students choose activities beyond the classroom ranging from archeology to rafting to weaving. Service Learning: Upper School students must complete 15 hours of service each year. Semiannual Middle and Upper School Community Service Days. Technology Program includes a full-time Technology Integration Specialist to aid teachers and students. Writer’s Symposium: Each year, Overlake brings a nationally known writer to campus to work with students. There is also an evening lecture that is open to parents, students, alumni and the general public. 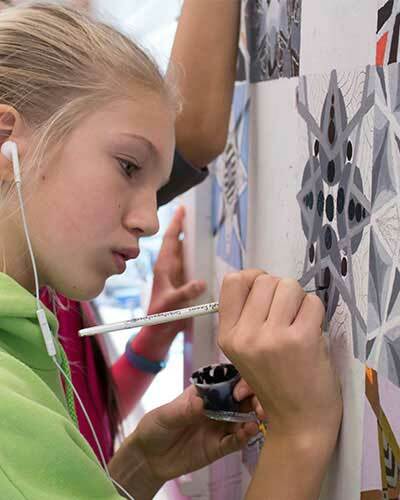 ArtsFest: An event held each spring that highlights the work of all the arts at Overlake, including visual arts exhibits, dance, drama, theatre sports, instrumental and vocal performances. Refreshments are served. This is a wonderful event for the whole family. Athletics Hall of Fame: A bi-annual event for everyone in the Overlake community, co-sponsored by the Alumni Association and the Athletics Department, honoring past Overlake athletes who made outstanding contributions to the school during their years here. Back to the Classroom: A day in early spring when parents are invited to visit school and to attend classes. You may visit your own child’s classes, or others, to learn more about other classes that you or your child may be interested in. Benefit Concert: A student-run concert that highlights the talents of both students and faculty, and is a charity benefit. This is an event for the whole family. Grandparents’ and Special Friends’ Day: Students invite their grandparents or other special friends to join them for the morning to share their school experience. Guests can enjoy a continental breakfast and musical performance, have photos taken, tour the campus and attend classes with their student. Grade-level retreats: Overnights for each grade, held at the beginning of the school year. Lunch with the MS and US Heads and Dean of Students: An informal opportunity for parents to have lunch with administrators and other parents to ask questions, and talk about events and issues at Overlake. Middle School Dances: Are held throughout the year for students in grades 7 and 8. The Overlake Show: A tongue-in-cheek, student /faculty talent contest for Upper School students. This is usually the first US student social of the school year. Olot: The reverse of Tolo; an ASB-sponsored US student dance where boys invite girls, however students may come in groups or independently too. Potlucks: Grade-level get-togethers held during the first few weeks of school to educate parents about the life of the school. Students in the younger grades are sometimes included. Prom: The Prom, an off-campus dance for junior and senior students, is held in the spring. Senior Brunch: An off-campus event for seniors and their parents only where senior advisors speak about each of their students. Tolo: The reverse of Olot; an ASB-sponsored US student dance where the girls invite the boys, or students come in groups or independently. Upper School Dances: Are sponsored by US ASB and are for students in grades 9 through 12. US Sports Night: An evening for students and parents to celebrate the accomplishments of Upper School athletes. ASB: Associated Student Body; the student government associations for both MS and US. Green and Gold: A year-long, lively, multi-faceted student competition for Middle School. Students in grades 5-8 compete in read-a-thons, math competitions and other activities throughout the year, culminating with MS Field Day. New students are assigned a team at the beginning of the school year. Team membership lasts all through the MS years. The Hoot: The MS literary magazine published each spring. Hootie: The Overlake School mascot who appears at athletics and other events. The Independent: The Upper School student newspaper. Not distributed to parents, but students may take copies home. OAC: Overlake Athletics Club supports the athletics program at Overlake. All parents are welcome, even if their students don’t participate in interscholastic sports. OFTA: Overlake Friends of the Arts is an arts booster club that helps with costumes and in other areas of the arts. All parents are welcome, even if their students don’t participate. Opus: The US literary magazine published in the spring. PFSA: Overlake’s Parent, Faculty, Staff Alliance. Meetings are held monthly and are listed on the calendar. The accreditation team follows NWAIS standards, as outlined in the NWAIS Accreditation Handbook.